What is a 1 to 1 function? 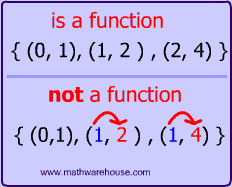 Look at the two functions below, ( # 1 and #2). They only differ by a single number . 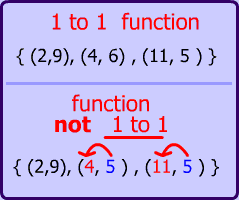 One of the functions is a one to one function, and the other is not. Which function, do you think, is 1 to 1 ? 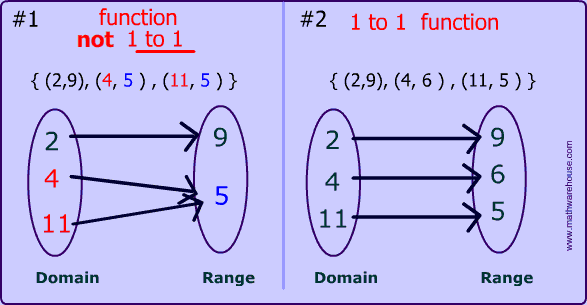 A one to one function is a function in which every element in the range corresponds with one and only one element in the domain. 5 goes with 2 different values in the range (4 and 11). 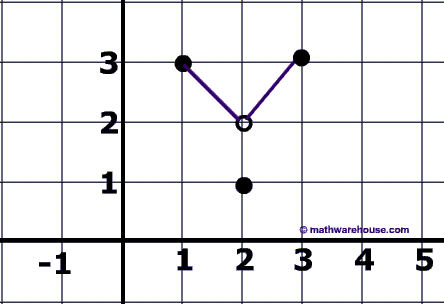 How to know if f(x) is 1 to 1? In our prior lesson, we said that the domain elements cannot repeat. 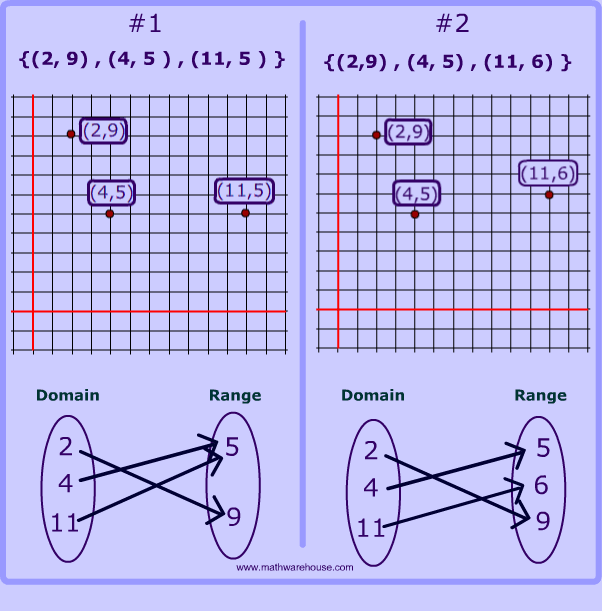 As we learned in our vertical line test lesson, this is really the exact same as saying "elements in the domain cannot repeat"
" each element in range must go to a unique element in the domain "
Below you can see an arrow chart diagram that illustrates the difference between a regular function and a one to one function. Function #1 is not a 1 to 1 because the range element of '5' goes with two different elements( 4 and 11 ) in the domain. 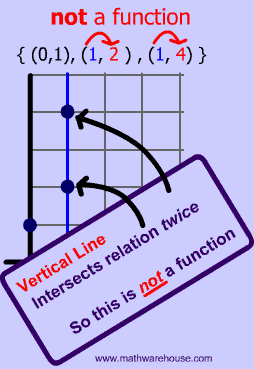 We can also look at the graphs of functions and use the horizontal line test to determine that the given function is not 1 to 1. Which functions below are 1 to 1? Relation #1 and Relation #3 are both one-to-one functions. Which functions below are one to one ? Is the function below a one to-one function ? Yes, because every element in the range is matched with only 1 element in the domain. 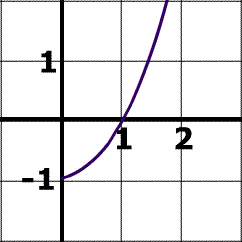 Use the horizontal line test and your knowledge of 1 to 1 functions to determine whether or not each graph below is 1 to 1. 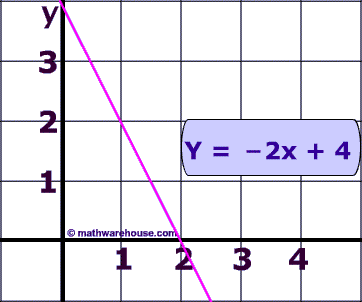 Ask yourself: "Can I draw a horizontal line (anywhere) that will hit the graph two times ?" Since the answer is 'yes', this is not a one-to-one function. Since the answer is 'no', this is a one-to-one function. Since the answer is 'no', this is a 1 to 1 function. Are all lines one to one like the prior problem was? 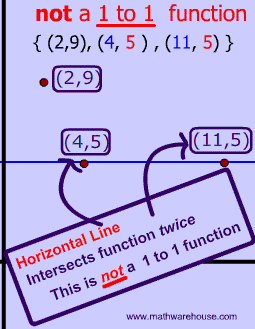 If not, which types of lines are one to one and which types are not? 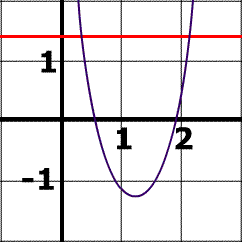 Vertical lines such as x= 2 are not functions at all. All other lines are indeed one to one functions. Are parabolas 1 to 1?